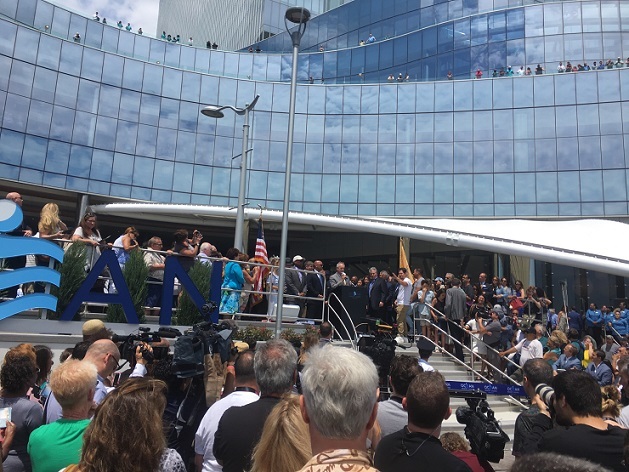 The opening ceremony for one new Atlantic City casino on Thursday started 25 minutes late. The opening ceremony for the other only lasted 25 minutes from start to finish. 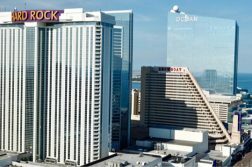 Such were the contrasting styles of the organizers behind the events of the Hard Rock Casino and Ocean Resort — the two properties once known as Trump Taj Mahal and Revel, respectively. 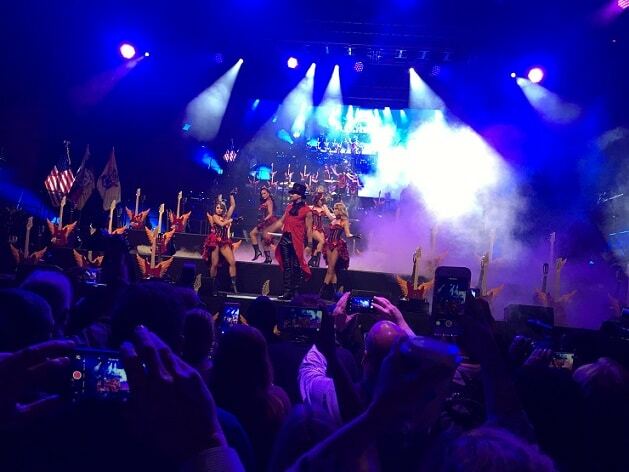 Hard Rock chief executive Jim Allen ran a lavish — if wordy — 75-minute show at the casino’s Etess Arena, with dozens of Seminole Tribe members, seemingly almost as many speakers, fireworks, neon robots, and Vegas-style performers who were opening acts to a guitar-smashing routine by two dozen people. Smashers included actor Michael B. Jordan (Black Panther, Creed), while Bruce Springsteen’s drummer, Max Weinberg, was the musical accompaniment for the finale as balloons landed on the crowd like it was New Year’s. Ocean Resort CEO Bruce Deifik, meanwhile, had a smaller event on the Boardwalk, with speakers looking out at the Atlantic Ocean. Mark Wahlberg — who played Philadelphia Eagles overachiever Vince Papale in the 2006 movie Invincible — was a celebrity guest for an event that ended with a traditional ribbon-cutting that featured the current Miss New Jersey. Wahlberg — who in spite of that movie was ribbed by many in the crowd aware of his allegiance to the Super Bowl-losing New England Patriots — dutifully said, “I gotta say — E-A-G-L-E-S,” to their delight. Wahlberg’s family owns a restaurant in the casino. Betting on a sure thing? Officials at both casinos insist that their focus is on “growing the pie” of visitors to Atlantic City, not simply cannibalizing the seven properties that survived a 2014-’16 purge that led to closure of five casinos. Atlantic City Mayor Frank Gilliam said that while some speakers at Hard Rock had noted that the operators were “taking a chance” by investing in what for a decade had been a beleaguered locale, “really, they are betting on a sure thing” given the resurgence of development citywide in the last two to three years. “Atlantic City’s almost back — almost,” Gilliam said. The city’s decline had accelerated beginning in 2006, when competing casinos and racinos near the state’s borders in Pennsylvania and New York debuted. 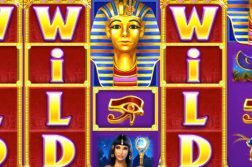 City officials in recent years have focused on adding non-gaming attractions on the Boardwalk and attracting real estate investors and new businesses. The familiar rock-and-roll theme is everywhere at this Atlantic City locale, as it is in their nearly 200 properties in 75 countries worldwide. Of course, concerts are a key component as well — and Hard Rock has Carrie Underwood performing on Friday, followed by Pitbull on Saturday. The “arrogance” was a reference to a widely-held perception of the Revel property, which opened to great fanfare in 2012 and closed, bankrupt, in 2014. Two-night minimums for stays, the lack of inexpensive buffet options, and smoke-free status alienated a wide variety of guests. Deifik pointed to a pair of outside walls that are no longer joined. 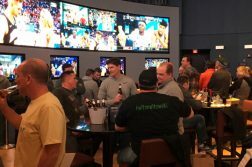 The casino floor configuration — a source of confusion for Revel guests — has been rearranged, there is all-new carpeting, and there’s even a sports book that places Ocean third in the state behind Monmouth Park and Borgata to offer that newly available amenity. Hard Rock has a sports betting-related clause in its naming rights deal on the Miami Dolphins’ Hard Rock Stadium that at least temporarily leaves the casino without sports betting. It was no surprise to see more people lined up by the hundreds at Hard Rock to sign up for loyalty cards, given the familiar brand name to visitors. But Ocean also had healthy lines on the first full day of gambling there.